The betrayal of the Satanic globalists. The Kalergi Genocide Fascists on the white race are in the Brussels and our Bilderberg Mafia politics. I am not writing this piece to speculate but to make it clear that we can change it by working together. The Hypocrite Satan Reformed Party? 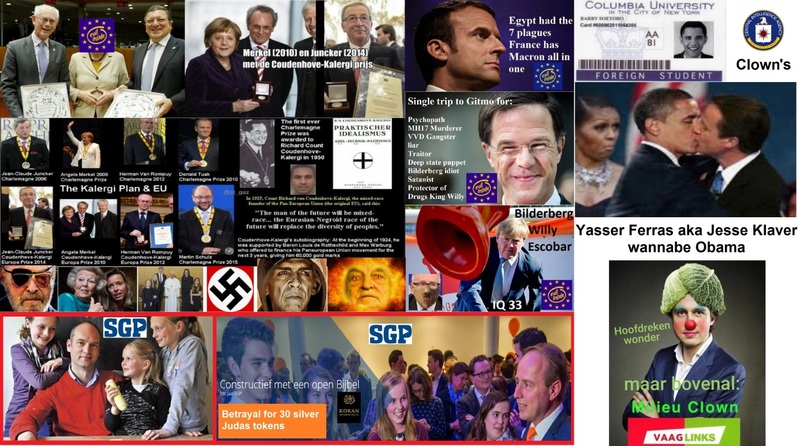 Will the Gert Jan Segers from the SGP sacrifice his own family and the Netherlands on the altar of Islam and satanic Elite, for 30 losses of silver to the Genocide Kalergi plan on their own race? Or does she drop the Rutte 3 to save the Netherlands from a flood of Islam Migrants, so that the UN Immigration Pact cannot be signed in Marrakech. All this looks hopeless, but it is not. 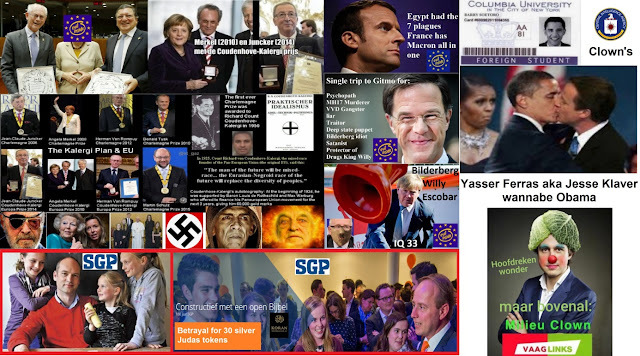 My post of 3 / 4 November 2018 I refer to my invention that makes oil and gas far superfluous, we are not dependent on oil from the Middle East: https://operationdisclosure.blogspot.com/2018/11/rinus-verhagen-free-life-world.html?fbclid=IwAR2_-AE7dSXTbTtw6TXuUHT-p6LLRjUXu90ofWy05lTRMNv-ZwfcBNbERoM where you can find a tool to apply for projects yourself. All this will be paid for by the announcement and implementation of the GESARA Global Economic Security and Reformation Act. 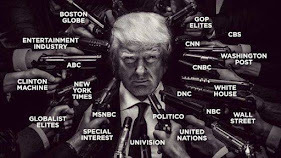 The more than 60,000 sealed indictments against Cabal Globalists, Pedophiles, Corrupt administrators, Drug traffickers, money laundering criminals will be arrested worldwide. Many if not all Bilderberg criminals will be tried before a tribunal for their crime against humanity. Trump has already been asked to take the Chemtrails planes out of the air, Putin and Xi Jinping will help here to make this possible all over the world. Alternative Energy will make us completely independent of fossil fuels within 2 to 3 years. It is therefore sensible and necessary for people who receive funds to coordinate with each other in order to discuss and implement a joint action plan. We are shortly before the RV/GCR so that the funds will be released. I suspect that existing politics are not so positive about our plans. If you do not want to hear or listen, you just have to feel, they become unemployed together and will experience for themselves what they have done to us. That is why I have thought of the following so that we can never be ignored again. We have all the expertise in-house, and you are all indirect investors through your individual projects and objectives. We hire many people who are unemployed and who work for companies. To force and awaken the government. 1, We start a project elderly care and needy, where we offer people without a job to help and guide elderly and needy people in their household, they have earned it 100%, because it is our parents and weaker people from our society, that we can treat with love and respect. This means that we create hundreds of jobs at local level where we do not receive income, but do provide employment and social services. 2, To force the local authorities to join us, we will apply for personnel to perform maintenance work in the municipality, we will buy these people away from public works, and we offer our service for free. 3, We are going to start a training program, in which we will teach general social knowledge and history, but also technical and or manual knowledge in several areas. Here too there is room for people who are without work. 4, We will approach all entrepreneurs from the region to employ their personnel who will continue to work for this entrepreneur, who receive the salary from us, for which we have to pay yellow wage tax under GESARA, so the entrepreneur has no risk and if no work the employee can be deployed elsewhere. As a result, being a company can be much cheaper to work for, so the VAT will be much lower. 5, We are going to buy large buildings in the region that will be used for the above mentioned activities, where also people who have now been excluded from society, will get shelter and a right to exist again, so no homeless person will have to survive on the streets anymore. 6, If the prototype of the Hydrobooster can be produced, this will also create many jobs, we will do this throughout the Netherlands and the world and take over the working method we are now going to start with. 7, They will offer us the necessary land to provide employment there as well, municipalities will take the plunge to come into our favor for our employment plans and job creation. 8, This means that schools and existing care institutions will contact us to survive themselves, and we can then use their infrastructure and system if this fits in with our story. 9, This requires a lot of work, which will also create jobs, this can be filled by people who become complete in municipalities about. 10, We are going to buy land all over Europe to start projects, which means that we can share knowledge with people who live and work there. For this purpose, people we train ourselves first will add to these projects on a voluntary basis with a supplement on their salary. 11, Everyone who goes to work with us will then be free of risk, and will indirectly be able to propose an investment project, just like the first team members. 12, For this we need people who will also act as project couch to support and to ensure that funds and resources are used as agreed. 13, We can adjust this way of approach at any time according to needs and process development. We regularly consult with other investors who are working on such projects around the world, in order to achieve optimal results. Think that this will bring a storm of positive developments, because who wouldn't want to be part of a winning team? This will ensure that the changes come from the bottom up, and make old politics completely powerless and out of the way, because they do not have access to funds that are used against the population. With this letter, I hope to unlock the action, and wait for your reaction, so that we can interactively start the whole program together. Look in your own network for people who want to help shape these plans at the first hour. The setup is so simple that it can be introduced anywhere without governments being able to sabotage it. I am giving the first move here to set this change in motion, you push more to get to speed, the group that is going to work with will grow like coal and accelerate the total process. 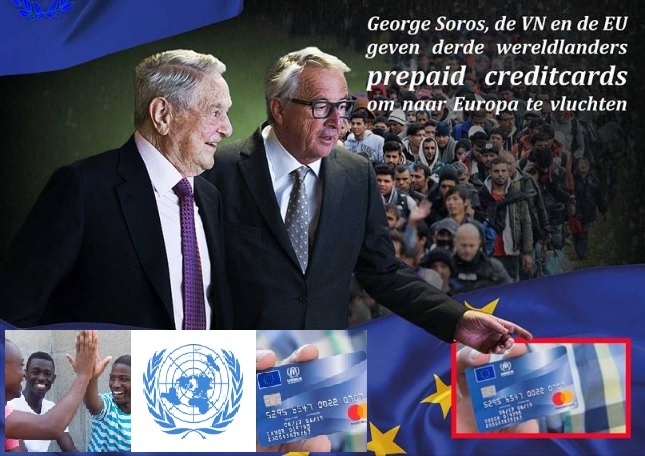 The Globalists never expected this, they can't change it or stop it with their state propaganda because of lack of money, who doesn't cooperate through the QFS and CIPS outside closed also the EU, Nato, UN and many criminals. The strength lies in connecting and taking action together. Before we roll this out in this way I would like to have a meeting with you, at which you will all do homework to submit questions or proposals first, which we will discuss. This way we will decide together how we will really shape and fill it in together, I will only give a assistance and support, you can participate. I would like to ask you to use projects-nl@freelife.world for further mutual communication.